The Senegal Parrot is one of the most heavily trapped wild birds in the world; since 1981, 735,775 birds have been recorded in international trade. P.s. 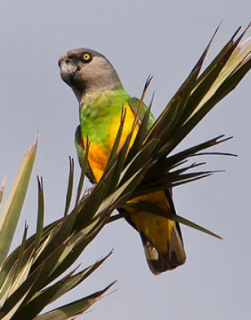 senegalus: Both adults mostly green, yellow on rump; head grey with dark crown, yellow lower breast and abdomen, tinged orange in centre; bright yellow underwing coverts and undertail coverts; thighs green. Bill grey; bare cere and eye ring dark grey. Eye yellow. P.s. versteri: As in senegalus, but darker green upperparts; lower breast to abdomen orange/red in centre. P.s. mesotypus: Paler than senegalus; green breast extends more down toward orange abdomen. Juveniles generally duller than adult; breast and abdomen green suffusion. Bill pink/white tipped grey. Eye ring pale grey, eye dark brown. Noisy with large variety of mainly harsh and high-pitched screeches, squawks and whistles. More raucous when excited. Walk-in aviariy, minimum length 2.1m (7 ft), or indoor cage minimum length 1.8m (6 ft). Cooked beans and pulses, boiled corn; sunflower, dry, soaked or sprouted; walnuts greatly favoured; fruit such as: apple, orange, banana, rearing food (hard-boiled egg, wholegrain bread and carrot, ground to crumbly consistency); fresh vegetables such as: carrot, celery, green beans and peas in the pod; complete pellet. Provide overhead misters or shallow water bowls for bathing; foot toys, destructible (non-toxic) toys, non-destructible (non-toxic plastic) toys, food-finder toys, preening toys, different texture and size hanging perch toys, fir branches, push-and-pull toys (sliding up and down), vegetable tanned leather toys. Heavily trapped for wild bird trade. P.s. senegalus: W African dry belt, mostly north of lat 9N, from S Mauritania, Senegal, Guinea, including Los Islands and S Mali east to S Burkina Faso and N Nigeria. P.s. versteri: W African wet zone, north of rainforest belt to lat 9N from Liberia (introduced to Monrovia district) and Ivory Coast east to W Nigeria. P.s. mesotypus: E and NE Nigeria, to N Cameroon, south to Adamawa Plateau, SW Chad, and possibly NE Central African Republic. Found in wide range of wooded areas from open farmland with scattered trees to closed-canopy forests. Up to 1200m (3936 ft). Takes fruit, buds, seeds; also crop items such as millet and peanuts. Mostly sedentary, but will visit rainy areas. Usually found below 1000m (3280 ft). Social outside breeding season. Usually seen in pairs but also in flocks up to 20 or more to feed. 2 to 4 eggs, 29.5 x 26.0mm (1.1 x 1 in). Gambia and Senegal: April, May, August and September and from November to February. Mali: May-October.